SNV Calendar Lite is a highly customizable desktop monthly calendar that allows you to verify the accuracy of your dates. With this calendar program a selected date can be copied to the Clipboard, the difference between a current date and another date can be calculated, the background picture, color scheme, first day of the week, and other properties may be set. 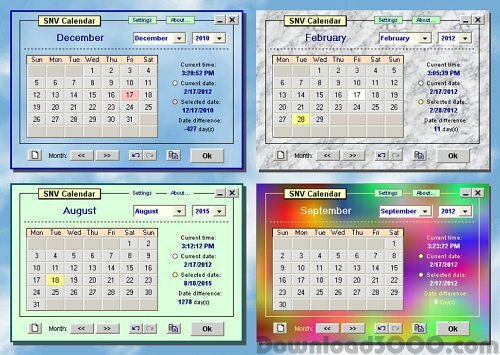 An important feature of SNV Calendar is that its multiple instances can be opened as separate windows - each with different appearance. SNV Calendar Lite is absolutely free program. It works on Windows 7/XP/Vista.